I'm a little late posting this because life has seemed to get in the way of everything lately, but ... here are the details for the fourth installment of S.M. 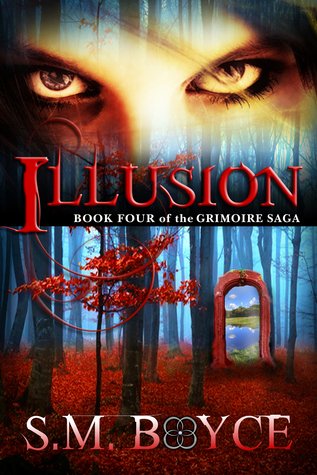 Boyce's The Grimoire Saga, Illusion. Dozens of boots stomped up the stairs. Floorboards creaked. A rumble of voices slipped beneath the door. She took a deep breath—time for the fun to begin. The handle turned, and the door swung inward. Andor paused on the threshold, eyes on her the moment he peered into the room. He closed his eyes and sucked in a breath, squaring his shoulders in either annoyance or preparation. His Adam’s apple quivered. She smiled wider. Sucker. “That’s what will make you so fun,” she countered. He frowned, eyes narrowing. He stared at her with a gaze that almost stole the smile from her face. It bored into her, sending a flurry of nerves through her chest as he waited for her to crack beneath his gaze. She held on, despite his scrutiny. She’d successfully killed Niccoli this time. She absorbed a Blood. She would bring Niccoli’s remaining guild to its knees. Andor—of all isen—couldn’t shake her. He inched closer, his boots thumping against the floor. Each slow step chipped away at her smile. He knelt on the mattress and leaned in, setting a hand on either side of her head. His fingers stretched against the wooden headboard in her periphery, cracking with his movements, but she never broke eye contact. He inched closer until the world blurred around him and she could see only his eyes. He was turning this on her, calling her bluff. Maybe he knew her seductions were always a tease, that she never followed through. Perhaps he even figured she imagined Michael on the face of any man who invaded her space, who got too close. “What are you up to?” His hot breath rolled over her cheeks and tickled her neck.